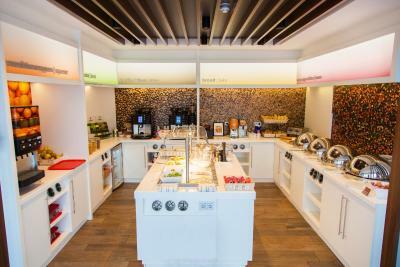 Lock in a great price for Hampton by Hilton Amsterdam Centre East – rated 8.6 by recent guests! The hotel was in a great location. Quiet and only 10 mins to the center near the train ststion The tram is right at hotel and 2 stops to central train station . Breakfast was very good. The breakfast was good considering it was included. I enjoyed the waffles. The room was very clean too. The staff were so friendly. The staff where super friendly and professional. The food was amazing and with a ton of selection. 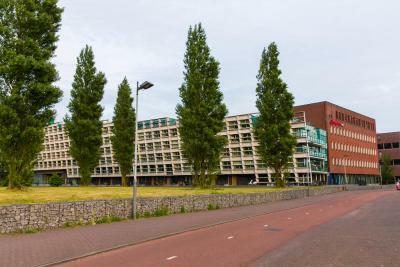 Location was excellent, right next to tram station. 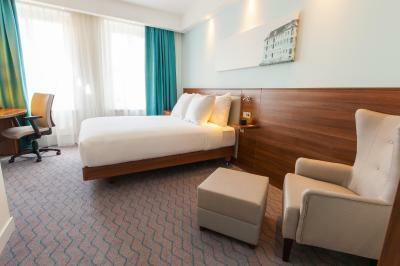 The location of the hotel is very good, public transport 3 mins to walk to; 5 mins journey to the city center. 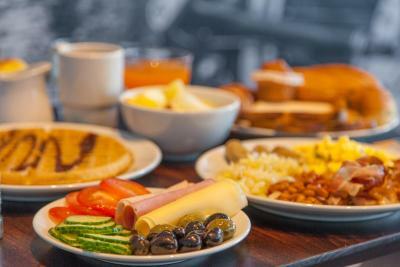 The staff was really polite and helpful, room was cleaned everyday, the breakfast was plentiful, great choice and variety. 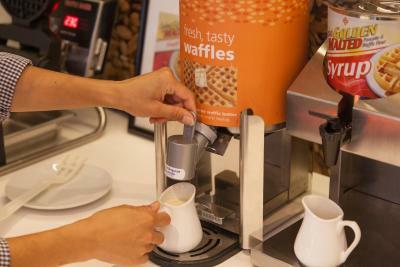 You could make your own fresh waffle :). The property was very clean, breakfast was amazing and our room was always clean!! Daniel at the front desk was very helpful and knowledgeable about places we needed to go. The other ladies their helped us navigate our way to the Nike store by printing out directions. It seemed they went above and beyond their duties to make sure my stay was top notch and it was. Clean and have tea facilities in the room the bathroom was amazing . The breakfast excellent and near the center of Amsterdam . Also quite nice to sleep and the room facilities very good has every thing u need. Wonderful hotel, the location was great and very much convinient to public transport.The bed was super comfy and the breakfast was amazing! Sad that my trip was short but definitely I would come back again and stay at this hotel. The staff were very kind to us and they helped us getting from place to place. 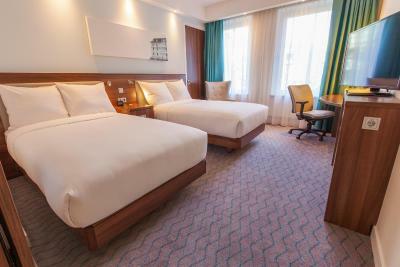 The room was very clean and we enjoyed every minute in it. The breakfast had a vast verity and it was tasty. 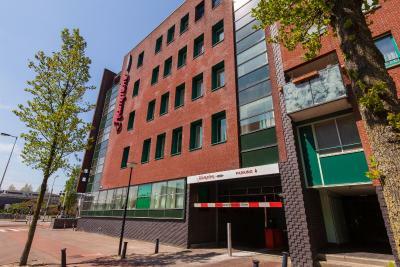 Hampton by Hilton Amsterdam Centre East This rating is a reflection of how the property compares to the industry standard when it comes to price, facilities and services available. It's based on a self-evaluation by the property. Use this rating to help choose your stay! 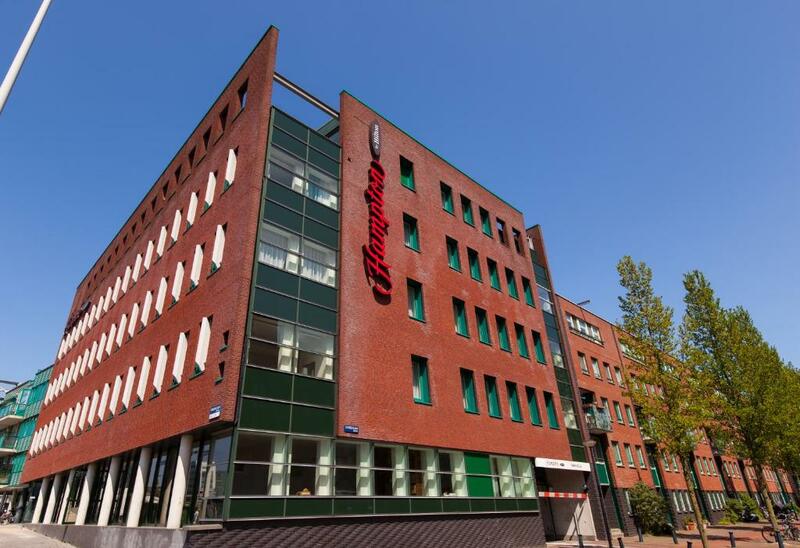 One of our top picks in Amsterdam.Hampton by Hilton Amsterdam Center East is located in the Zeeburg district in Amsterdam, a 22-minute drive from Schiphol Airport. Rijksmuseum, Museum district and Leidseplein are a tram ride away. 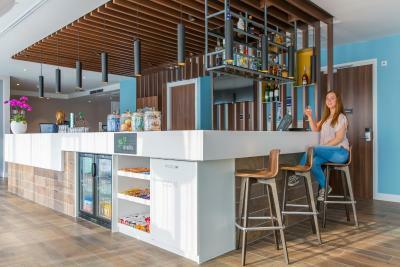 Guests can enjoy the on-site bar and free WiFi throughout. 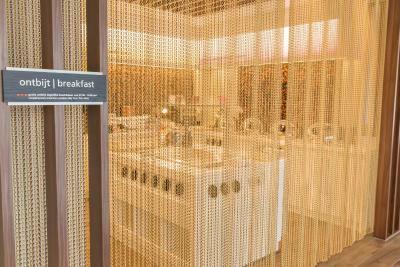 Start your morning with complimentary breakfast offering a choice of hot and cold items. 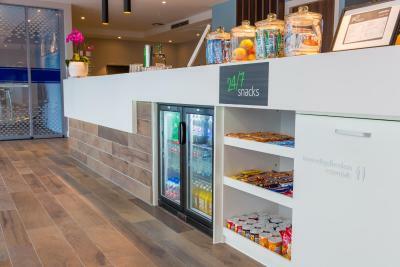 Grab a snack or a single-serve drink from our 24/7 hub. 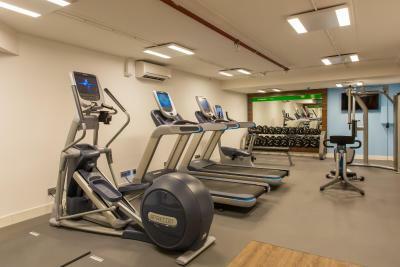 Guests benefit from a 24/7 business center, fitness area and secured paid parking on site (when available). 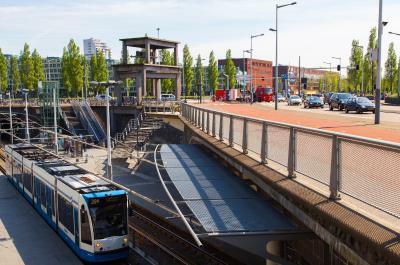 Rietlandpark tram stop is only 800 feet away, providing direct connections into the heart of the city and to central station within 10 minutes. 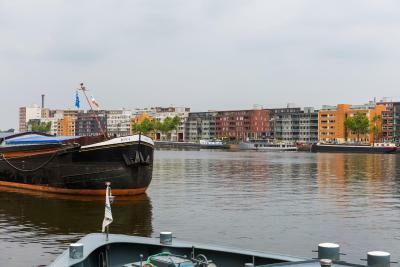 Rembrandtplein is 1.7 mi from Hampton by Hilton Amsterdam Center East, while Royal Palace Amsterdam is 1.7 mi from the property. 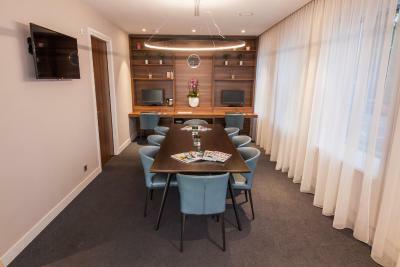 When would you like to stay at Hampton by Hilton Amsterdam Centre East? Rooms are 22 square yards and feature comfortable 150 x 79 in bedding. These Queen Rooms are 24 square yards and feature a comfortable 150 x 79 in bed as well as a double sofa bed. It can accommodate up to 3 people. These Twin Rooms are 22 square yards and feature 2 comfortable single beds of 120 x 79 in each. 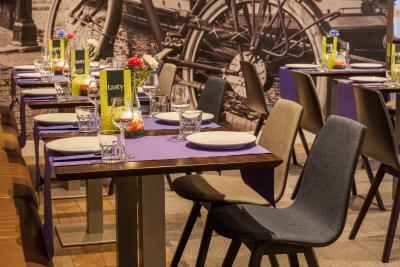 Hampton by Hilton Amsterdam Centre East, a modern and charming hotel located close to the city center and only 22 minutes drive from Schiphol Airport. The Rietlandpark tram stop is only 600 meters from the hotel, offering access to Amsterdam central station within 10 minutes. 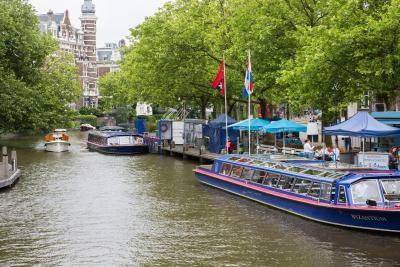 Rijksmuseum, Leideseplein entertainment district and Amsterdam museum district are also easily accessible from Rietlandpark tram strop. 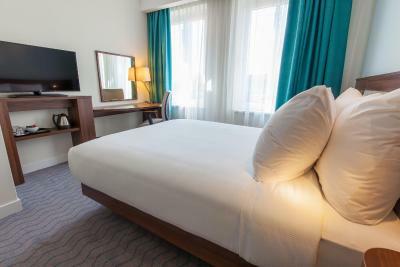 Our well appointed rooms featuring comfortable bed, air-conditioning, walk-in rain shower, 40-inch HDTV and double-glazed windows. 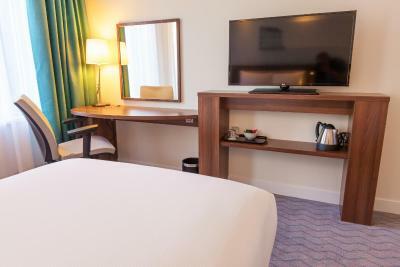 Enjoy the convenience of having coffee and tea facilities and iron with ironing board in your room. All rooms are non smoking. 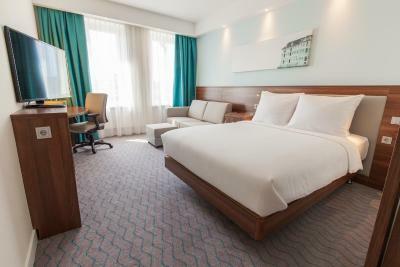 Free WiFi is available in all rooms and hotel areas. 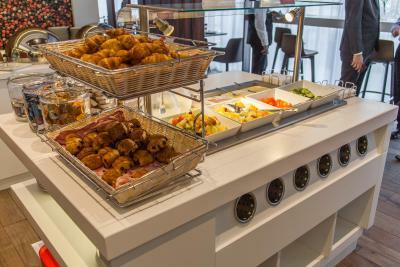 Start your morning with our complimentary breakfast offering a choice of delicious hot and cold items. 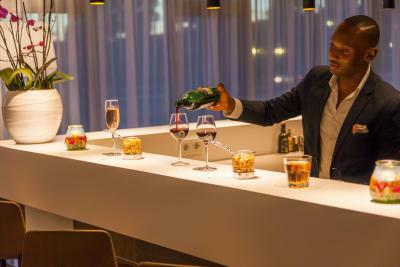 Grab a snacks or a single-serve drinks from our 24/7 hub or unwind yourself with a drink in our bar. 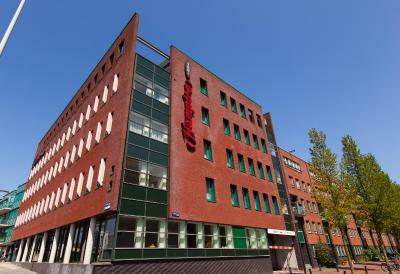 Use our 24hours business centre for your business work. Stay on top of work and exercise in the 24-hour fitness center. A secure parking facility is also available at the hotel for a fee. 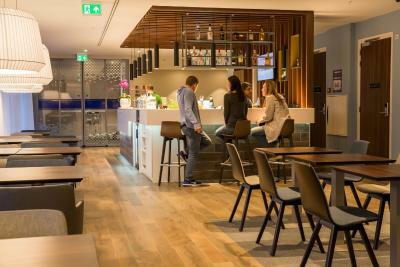 House Rules Hampton by Hilton Amsterdam Centre East takes special requests – add in the next step! 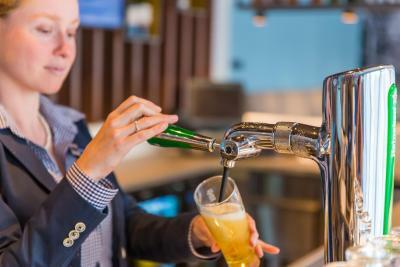 ATM card Hampton by Hilton Amsterdam Centre East accepts these cards and reserves the right to temporarily hold an amount prior to arrival. 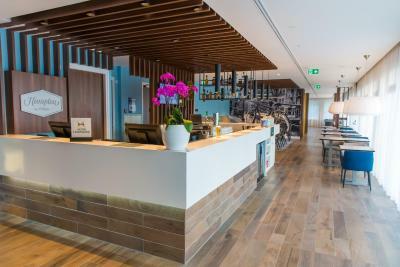 Hampton by Hilton Amsterdam Centre East accepts these cards and reserves the right to temporarily hold an amount prior to arrival. 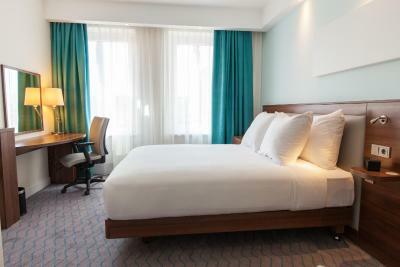 When booking for 8 rooms or more, different policies and additional supplements will apply. Please note that the credit card that is being used for the advance purchase reservation needs to be shown upon check -in. The hotel hold the rights to per-authorize credit cards. I was really disappointed to find out that booking.com is selling this hotel as 4 stars but in reality it is a 3 star hotel. The hotel staff confirmed this as well. So all the facilities which you can expect from 4 star hotel were not available like assistance in carrying luggage, swimming pool, complementary water, variety in breakfast etc was missing . 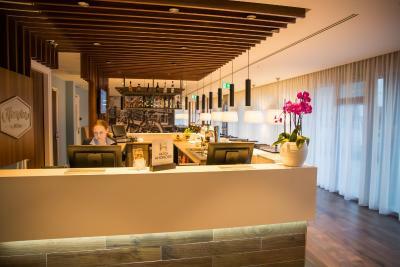 The staff was very supportive , location was close to the tram station and the cleaners service was good . Breakfast has same dishes every day no varity. very friendly staff, clean room. The breakfast was awesome. Great food, great atmosphere, and and lots of room to dine! Also liked the double pane windows in the bedrooms which made it very quiet. The staff was very helpful and friendly!! Bed was very uncomfortable . Not a lot of selection for breakfast . The only slight very thing is that there is no hot food available at the hotel in the evening except for pizza. However, with the number and variety of restaurants a short distance away, this was not a problem. Liked the location - just 3 tram stops from Amsterdam Centraal which takes about 8 minutes and the tram station was about a 2 minute walk from the hotel. Staff were very professional and helpful - they were genuinely happy to help with any requests. 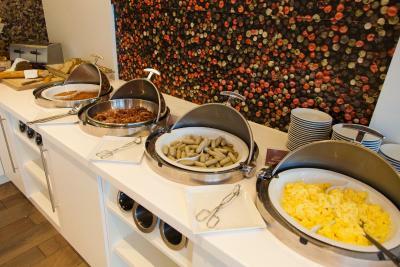 The breakfast is also excellent with a selection of both hot and cold food each morning. 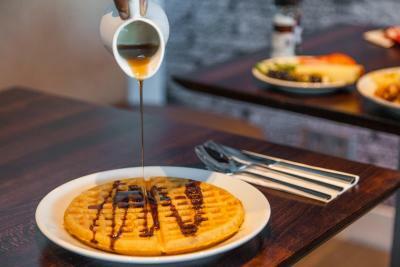 Breakfast available until 11am on the weekend. We asked for a quiet room, and that's what we got. Toiletries in the room were of a very good quality and the bathroom was very modern and clean. Complimentary safe in the room, which is also a great touch. Overall, could not find fault with anything at this hotel. I'd definitely stay there again or if anyone I know was going, I'd definitely recommend it. The hotel was overbooked when we arrived and had to stay in another hotel the 1st night.However we were compensated by having a free breakfast,free cocktails and free souvenirs .My contention is that hotels should not allow overbooking in the first place. Seating in the bar area could have been better. Large comfy beds. Good breakfast. Very helpful staff. As per our previous visit to this hotel the staff were very friendly and so willing to help with any request. Not enough teabags in the room (only 2 in a triple), the towels are very small and the extractor didn't work in the bathroom so it got a bit stinky!! Excellent breakfast spread (such a shame the waffle machine wasn't working the second morning, though!). Really enjoyed the hot and cold selection. The staff are very attentive. The beds were super comfy.